Gondwana Rainforests is an initiative to protect the ancient rainforests of Australia. 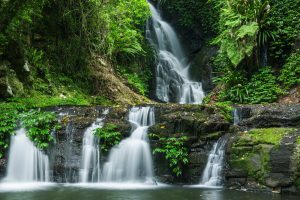 The Gondwana Rainforests of Australia World Heritage Area includes extensive areas of critically endangered subtropical rainforest, warm temperate rainforest and most of the remaining Antarctic beech cool temperate rainforest. These vegetation communities contain many plants and animals that provide insights into how wildlife have persisted over millennia. Healthy Land and Water are working with the City of Gold Coast, Gold Coast Catchments Association, Scenic Rim Regional Council, Border Ranges Alliance and local landholders to build connectivity between components of the World Heritage Area, restore and rehabilitate lands that buffer the World Heritage Area, and promote local community awareness of the rare and threatened species that call the Gondwana Rainforests home. A recent partnership project funded by the state government and delivered by Healthy Land and Water, the Border Ranges Alliance, and Scenic Rim Regional Council, has enabled improvements to over 82 hectares of privately managed land adjacent to the World Heritage Area. Activities such as weed control, fire planning and construction of nearly 20km of firelines and planting of over 1800 trees has helped restore and enhance local waterways and habitats for threatened species such as Koala, Glossy Black-cockatoo, Brush-tailed Rock-wallaby, Spotted-tailed Quoll, Eastern Bristlebird and Red Goshawk. In addition, surveys using wildlife cameras and a conservation detection dog, confirmed the presence of Eastern Bristlebird and Brush-tailed Rock-wallaby. In addition, Healthy Land and Water staff serve on the Ministerial-appointed Community and Technical Advisory Committees that provide policy and management advice to this World Heritage Area.